Business group advice and corporate company direction as businesspeople guided by roads shaped as a pointing hand with 3D illustration elements. He went on to say…..
Having individuals within firms being held personally accountable for their work has been shown to affect outcomes positively in a number of sectors. This leads directly into a consideration of ‘Reasonable Steps’. 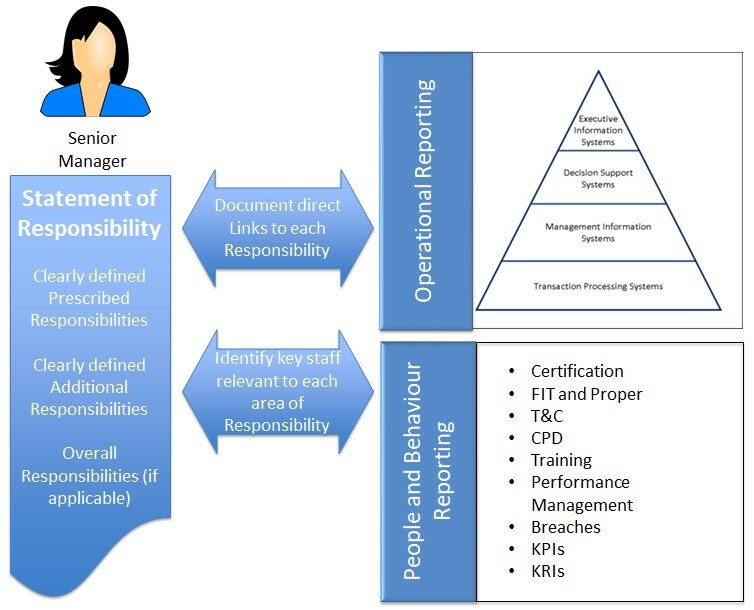 As key elements of the Accountability regime, Reasonable Steps, the Senior Manager’s Conduct Rules and the linked ‘Duty of Responsibility’ all reflect the above objective for ‘managing culture’. But there are significant risks which need to be navigated. In the lecture, she makes the point there is a high risk that the new ‘accountability’ obligations result in organisations focusing on the wrong things – focus on measuring that which can be easily measured such as volumes of complaints or exam pass rates. This ‘out of focus’ monitoring results in a constraint of professional judgement, preventing the experienced professional managers using their judgement to best effect because they are being obliged to work within frameworks and to standards set by governance teams without specific knowledge of their day jobs. If it is not properly implemented, the extended Accountability regime risks not only changing but in fact distorting the intended outcomes and may even damage the Culture and Conduct within firms. Although the specifics of what GDP measures are not relevant to Accountability, the point is very clear. When implementing your programmes for Accountability have a care to consider the implications for culture and the day to day impact on staff conduct. Check that you are not adding new process or monitoring just because it is possible, rather than because it will genuinely add value. A very good example of effective ‘accountability’ can be found in the World Health Organisation’s (WHO) ‘Surgical Safety Checklist’. It was developed with the aims of decreasing errors and adverse complications, and, increasing teamwork and communication in surgery. The result is a very simple seeming 19-item checklist (http://www.who.int/patientsafety/safesurgery/tools_resources/SSSL_Checklist_finalJun08.pdf?ua=1). Its simplicity has been the key to its success. By following a few critical steps, health care professionals can minimize the most common and avoidable risks endangering the lives and well-being of surgical patients. It has gone on to show signiﬁcant reduction in both morbidity and mortality and is now used by a majority of surgical providers around the world. When it was first introduced, most staff, predominantly nurses and anaesthetists agreed that the ‘Checklist’ was beneficial, but a few staff, mostly surgeons initially thought it was time consuming ‘admin’. However, over 93% of surgeons confirmed they would want the ‘checklist’ to be used if they were the patient! If we consider the above factors, the Checklist itself could be considered a relatively minor change, the other four reasons are certainly also very significant. Interestingly, the ‘Hawthorne Effect’ is a term first used in 1958 by Henry Landsberger, when analysing some experiments into staff productivity undertaken at the ‘Hawthorne Works’ factory near Chicago. The workers’ productivity seemed to improve when changes were made and being monitored but it fell back when the study ended, even though the ‘changes’ persisted. Henry Landsberger suggested that the productivity gains occurred as a result of the workers feeling motivated by the attention and interest being shown in them, rather than the changes to their working conditions. All of these reasons for improvement are relevant to the introduction of Accountability within Financial Services. Doing something that is proportionate and reasonable will evidence attention, focus and priority on the key topics, processes and obligations across the firm. If what is introduced is intelligent and sensible it should deliver at least some of these successful effects. 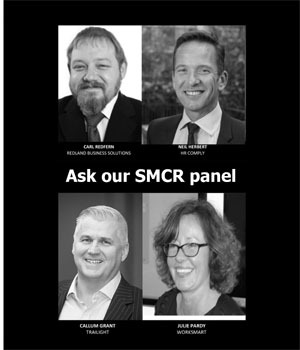 At a recent conference on the Extension of SMCR, one of the speakers was a significant regulatory litigation expert, who was presenting on the developments in Enforcement cases since the introduction of the new Accountability Regime. I had the opportunity to ask the burning question – would the most famous of all ‘accountability’ cases (Pottage) have had a different result if the new regime had been in force at the time? Her answer was interesting….in conclusion, NO! But in my humble opinion, her answer was a little blinkered – the outcome would not have changed but the whole case would not have taken place at all! The tribunal concluded that Mr Pottage was not guilty because he had taken ‘reasonable steps’. The issue under the APER regime and under the prevailing ‘culture’ at the time was that the evidence of his ‘reasonable steps’ was not readily to hand, hence the original enforcement action. The necessary evidence only eventually came to light following the testimony of expert witnesses at the tribunal. Under the Accountability Regime, if the firm and relevant Senior Managers were successfully complying with their obligations, the required evidence that Mr Pottage was taking the relevant and appropriate actions would have been immediately to hand and this most notorious of cases would never have been pursued. The costs of such cases are eye-watering for firms, the individuals involved and the regulators, without even considering the stress, distraction, disruption to business and risk to reputation. There is a small issue that some of these most material components of the new regime have fallen victim to the holy grail of ‘proportionality’ and therefore at first glance only apply to Enhanced Firms. However, be very careful if you are a ‘Core’ firm because most of these are essential elements of good governance practise and although not obliged under the new regime, you will need to evidence these things in reality if you are ever investigated. How do they know that the people involved (delegates and their teams) are competent, certified (were necessary), effective and informed? How can they evidence that they are reviewing the identified controls and taking the appropriate required actions and following them through to conclusions? These are two areas where using systems and process automation can help. Automating some process management to ensure that regular reviews take place and to provide some ‘oversight’ to relevant teams that evidence is being recorded is very efficient and provides a simple solution to managing the inherent risks. However, it is vital to ensure that any system or process management that is adopted is sufficiently flexible to push the necessary ‘actions’ to the appropriate people rather than creating administration tasks for your very busy senior managers. Resulting systems must also support the delicate balance between applying a ‘consistent’ policy across departments but allowing for individual senior managers to use their judgement about the detail record keeping that is relevant to their risks. There is a healthy amount of guidance within DEPP and COCON about reasonable steps but senior managers are rightly concerned and seeking confirmation that their frameworks and policies are sufficient, while at the same time, not over burdensome. To return to Onora O’Neill’s comments on Accountability, individuals should record an account of what they did, not a distorted history caused by over reliance on increasing sets of figures attempting to capture complex reality. 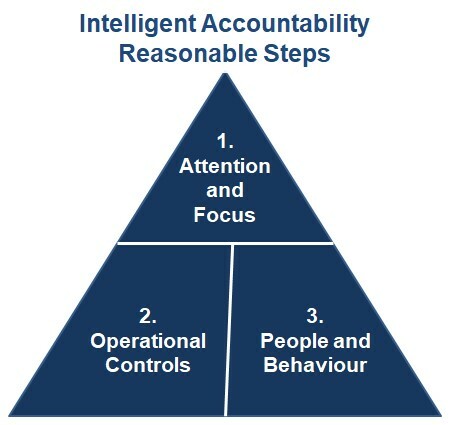 When implementing your Accountability Regime responses, try and leave space for simple, intelligent accounts of the sensible things your people were doing and why – a policy which reflects that will be a reasonable step towards managing our culture. Carl Redfern is the Compliance Director and co-founder of Redland Business Solutions, the market leader in specialist GRC Solutions for the Financial Services industry, for the past 15 years I have spent my time: •	Working with Industry Forums, Professional Bodies and Regulators to help to assess the impact and define the requirements of developing regulation. 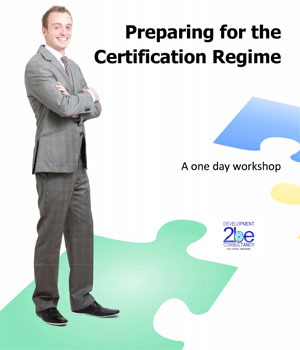 •	Designing solutions to support key strategic functions within Compliance, T&C, Conduct Risk, Governance and Operations. •	Helping businesses to develop the business case for people, culture and conduct initiatives. Most recently, I have been extensively involved in the development of the SM&CR regimes, working with industry bodies, both regulators and many firms, assessing the implications of the rules and designing specialist solutions to enable efficient and effective implementation. 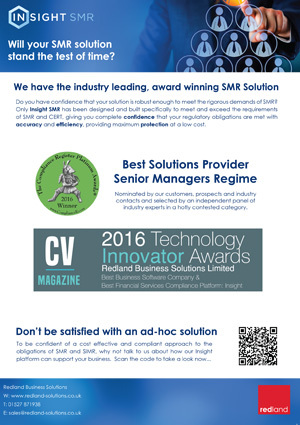 Redland have been voted the Best Solutions Provider – Senior Managers Regime with our specially designed technology solution, Insight SMR, to help firms comply with SM&CR and holistically integrate Certification with wider Culture and Conduct programmes.